What Are the Benefits of Arts & Crafts for Children? 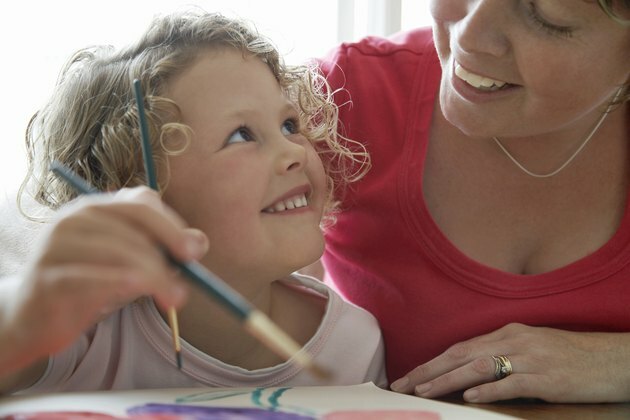 Although arts and crafts often fit together, they are different processes, according to art therapist Anna Reyner, writing for the Earlychildhood News website. Art involves unstructured activities in which you can explore with your imagination, whereas crafts involve structured activities with a specific goal in mind. When children participate in both arts and crafts, creativity and imagination receive strong stimulation, states the Americans for the Arts website. A child with a paintbrush in his hand suddenly has the ability to create vivid paintings and express himself boldly with color and brush strokes. The youngster can also learn about symbolic communication through the art he creates, choosing various colors to communicate feelings, for example. With exposure to various types of arts and crafts, a youngster can develop her own individual craftsmanship interests. Working with clay might spark a strong interest in pottery for a child, who can then go on to develop and enhance her skills and talents. The youngster can benefit from setting goals for achievement. As a child improves, she can also look back on her progress to note the strengthening and refinement of her skills. If you integrate art and crafts into your child's academics, your child can derive additional benefits. Many literacy and mathematical concepts can become easier to comprehend and even more interesting with the addition of art, according to Reyner. For example, if your youngster draws a picture or creates a sculpture of a character from a story, he may boost his reading comprehension and interest in literature. A child who uses artistic manipulatives such as paper shapes and beads can gain mastery of mathematical concepts due to the hands-on nature of the items. As your child creates a work of art, she has begun the process of communicating visually, advises author and educator MaryAnn F. Kohl, writing for Barnes and Noble Kids’ Expert Circle. A youngster also builds problem-solving skills, fine motor skills and even social skills as she works with artistic media. The process of making her own creations and noticing other people’s creations provides important opportunities for the appreciation of other people’s strengths and acceptance of her own abilities. A child also learns that the ability to follow directions is an integral part of the satisfaction of seeing the final result when making a craft.